We had our wedding ceremony & reception on board this weekend. Absolutely EVERYTHING was incredible. 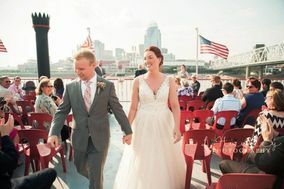 Missie is the best event planner around, and she loves the boats and her wedding couples. Each and every member of the staff went above and beyond what we asked at every single opportunity. There are no words to describe how incredible this experience has been! The food was great, the cruise was amazing, and you cannot beat the view! Thank you BB Riverboats, Capt. Mike, Missie & Crew -- we'll see you every September for our anniversary! ABSOLUTELY AMAZING! We had an incredible staff and the food was outstanding! Amanda was the sales lady that set everything up and Missie was our cruise director....two outstanding professionals who took all the pressure off this nervous bride! We had our rehearsal dinner on a cruise and everyone loved it. We had our own area of the boat and the staff was awesome! my bridesmaid had a slide show and they accommodated with the projector and even found us a laptop to use when her's wouldn't work. On top of that, the food and drink was top of the line! Definitely recommend. !